Many advanced first aiders will be trained to use additional monitoring equipment. In this blog post we discuss the use of pulse oximetry and its common indications and draw backs. Pulse oximetry is a simple non-invasive method of measuring the level of oxygen saturation in arterial blood. It works by assessing the absorption of infra-red light within oxygenated and non-oxygenated haemoglobin within the small arteries, usually in the finger-tip. The pulse oximeter then calculates the percentage of haemoglobin that is oxygenated and displays this as the oxygen saturation level on the screen. The display will often show the patient’s pulse rate as well. Hypoxia just means “low oxygen”. 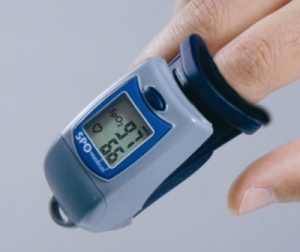 Pulse oximetry can be used on any patient as part of your patient assessment. Many organisations train pulse oximetry alongside the use of Oxygen therapy (which is outside the scope of this article). Respiratory conditions – Asthma / Chronic Obstructive Pulmonary Disease etc. In this situations remember to use your clinical judgement along with the pulse oximetry reading! How do defibrillators (AEDs) work?